Every summer, you can find me standing in front of our local ice cream stand hemming and hawing. I am the worst decision maker, especially when it comes to choosing an ice cream flavor so it’s a good thing it can sometimes take 20 or more minutes to make it to the front of line. And surprisingly enough, peanut butter cup ice cream isn’t ever a flavor that I choose, despite how much I love all things peanut butter-chocolate. I like to make it at home, to ensure that I’m going to love it…because when have I not loved homemade ice cream? Right, never. So when this particular recipe crossed my path – peanut butter ice cream made with eggs, unlike my usual recipe – I was all over it. And I had a super fun afternoon teaching my mom how to make ice cream with this recipe to prepare her for her first batch with her Mother’s Day gift. We added a [hot] fudge swirl and chopped up peanut butter cups to round out my idea of the perfect ice cream and she had a blast making ice cream from scratch – what an awesome feeling to teach my teacher! Following our pulled pork dinner, this family of peanut butter lovers collectively sighed over this ice cream…it’s a good thing I skipped lunch that day! The peanut butter is a bold flavor here and the addition of the fudge and peanut butter cups truly put this ice cream over the edge. I had to beg Kyle before I left for Vermont on Sunday to save some for me to photograph after getting home…and he commented yesterday that it took every ounce of his will power to not finish it. Good luck with your own will power after trying this – it won’t be easy! In a medium heatproof bowl, lightly whisk the egg yolks and 6 tbsp (1/4 cup + 2 tbsp) sugar together, just to incorporate the sugar and break up the yolks; set aside. In a large heatproof bowl, add the peanut butter. Set a mesh strainer over the large bowl and set aside. In a medium saucepan set over medium-high heat, warm the remaining sugar, cream, milk, and the salt until the sugar is dissolved and the mixture just begins to steam; reduce the heat to medium. Using a ladle, spoon about 1/4 cup of the cream mixture in slow stream into the egg mixture, whisking constantly to avoid cooking the eggs. Repeat until the temperature of the egg mixture just about matches the temperature of the cream mixture. Slowly pour the egg mixture into the saucepan and whisk it into the cream mixture. Cook the mixture, stirring constantly with a rubber heatproof spatula, until it thickens and coats the spatula, about 5 minutes. Carefully pour the custard base through the strainer and whisk it into the peanut butter until it becomes a cohesive mixture (there may be some peanut butter bits remaining, which is ok). Set the bowl in an ice water bath (a larger bowl with ice water in it) and stir the custard occasionally until it cools. Cover the bowl and chill the custard in the refrigerator for 4 hours or up to overnight. Freeze the custard in an ice cream maker according to manufacturer’s directions. As you pour the ice cream into the storage container, stir in dollops of the hot fudge sauce and handfuls of the chopped peanut butter cups. Freeze the ice cream in the freezer for at least 6 hours before serving. This looks sooo good, I want to have it for breakfast…Oh my. I have a Deni machine and love it, so I will try this soon. I am off to subscribe via email. The recipes have been so yummy looking. Looks like it is time to freeze the insert to my ice cream maker! This looks and sounds amazing. YUM! Oh. my. 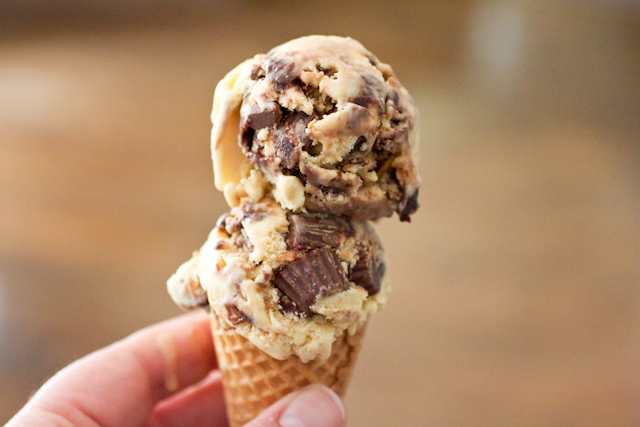 That is perfect ice cream. . .lots of peanut butter, chocolate, and pb cups!! Oh WOW! This. looks. perfect. Oh my goodness. 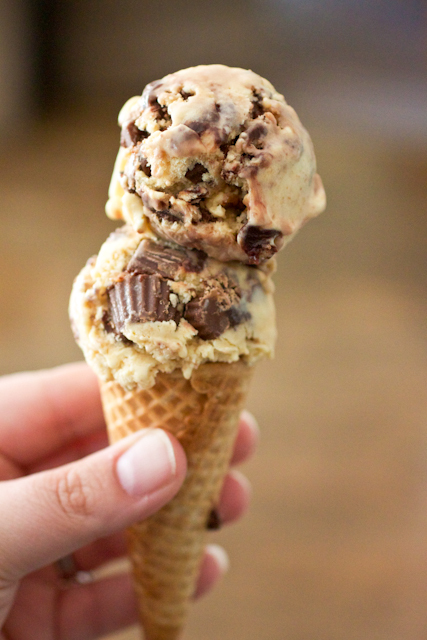 I am also a peanut butter-lover and I need to get some of this ice cream in my life. Beautiful pictures!